I can appreciate this quote because I also believe that the world looks better from the back of the horse. I love the pace, whether that is walking and enjoying all the detail you would miss from a car, or if it is galloping up a hill feeling the wind, smelling the fresh air and feeling the power of the horse I am riding. Traveling by horse gives me time to think and appreciate my surroundings. 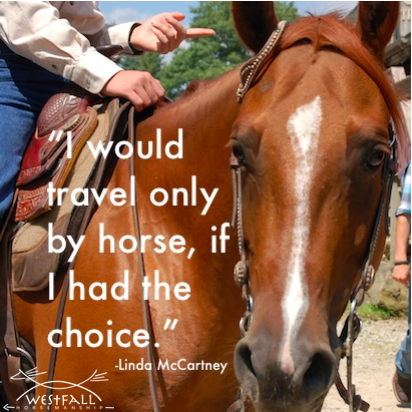 Do you prefer riding a horse over other forms of transportation? Why? Here is a link to a blog about a man who has been traveling by horseback for years! totally agree. I considered becoming Amish for a while and definitely like how they use transportation. absolutly! this is the reason why i love to have horseback holidays in different countries. i traveled canada, usa, iceland, ireland, france, switzerland – and it was just beautiful! as close to the land as it gets! I am not Amish but I strongly relate to their belief that travelling by horse makes one appreciate the world. Travelling by horse is green, relatively efficient, and does not tie one to paved roads. Many people now feel that travelling by horse is obsolete, that the inconvenience it may cause drivers is an unnecessary hassle, that people should “live in the 21st century” and use modern technology regardless of the cost to planet and person. There is an eccentric man who goes by Mule who travels up and down the west coast who is advocating freedom of movement, freedom of open space. He is often ticketed for being a “nuisance” – as if the hazards of mules being around cars has nothing to do with the cars, and drivers have no obligation to be careful or responsible. He may not be the mose eloquent advocate, but I strongly support his need to be free of the trappings we expect people to burden themselves with- especially motor vehicles. Someone built him a website “3mules.com” and a facebok page. If you also enjoy travelling by horse, his journey may be interesting to follow. It would be an ideal way to slow down and appreciate the moment rather than rush to the next thing and the next…. Yes. Because I don’t have to watch where I am going! 🙂 but true! Yes!!! I keep saying, it would be awesome if someone developed a town that only allowed horse travel in the entire vicinity. If the roads were made for horses (soft), no cars or trucks to think about. All the stores could have hitching rails, or better, small corrals everywhere. Especially if you had lots of stores and restaurants….. oooh, restaurants with horse fare 😉 . Friends houses could have a small stable instead of a garage, unless they owned a ranch, of course. And all the wonderful trainers and clinicians in the world (like Stacy Westfall) would want to live there or visit often and host clinics 😀 Hmmm…. what to call it…. what to call it? I would much rather travel by horse..
to me life, Nature, sounds and experiences are just always better with an animal partner..
cars and most electronic devices just pull us farther away from our feelings and true thoughts, and the realities of the living world around us. horses, and most domestic animals, are our last and best connection to Nature and true living. that, and the fact that i love them and life always feel better WITH them, no matter what.